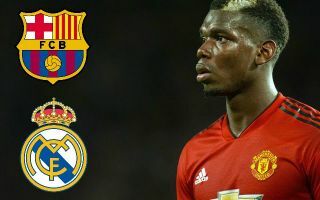 Manchester United midfielder Paul Pogba is reportedly eager to rejoin his former club Juventus in this January’s transfer window. The France international is reported as being fed up of life under Jose Mourinho and wants a link-up with Cristiano Ronaldo in Turin, according to the print edition of Tuttosport. Pogba has been at United since 2016, but has rarely shown the kind of world class form that made him such a hit in his first spell at Juventus. The Italian giants have gone from strength to strength without the 25-year-old in their squad, and it now genuinely looks like he’d be making a step up by returning to the Serie A side. With Ronaldo in their team now, Juventus will feel they have a genuine shot at Champions League glory this season after a couple of near-misses in recent years. Pogba would be another superb signing and would be able to play in Europe for Juve due to the cup-tied rule no longer being in place this season. The Frenchman will first meet Juventus in this season’s Champions League group stages with United, but Tuttosport claim he hopes to seal a move back to his old club this winter.